Global Active Calcium Silicate Market generated over USD 100 million for 2015, with consumption slated to exceed 119 kilo tons by 2024. Positive indicator in construction spending along with increasing acoustic insulation and passive fire protection (PFP) demand across construction & residential projects should drive active calcium silicate market size growth. Favorable government regulations towards implementing PFP in infrastructure spending should fuel product demand. It is used in heavy industries mainly for sound and fire proofing applications. European Association for Passive Fire Protection (EAPFP), directs and formulates guidelines regarding harmonization of fire safety standards in residential and commercial buildings. Active calcium silicate possesses adhesive, fire resistant, and intumescent characteristics and can be widely used in wallboard and acoustic tiles. In addition, it is used in brick and clay products to reduce shrinkage due to heat exposure and as safe asbestos substitutes. Global construction spending was over USD 7 trillion in 2015, with APAC responsible for over 20% spend, and may generate over USD 15.5 trillion by 2024, with over 7.5% gains. Robust public infrastructure spending across roadways, rail transports, harbors, and airports will favor active calcium silicate market. Stringent guidelines by OSHA and NIOSH towards product exposure may hinder active calcium silicate market demand. OSHA has directed permissible exposure limit (PEL) as 15 mg/m3 (respirable fraction) as 8-hour time weighted average (TWA). Excessive or prolonged exposure could have severe consequences on human health, leading to eyes redness & pain, itching, skin eruptions and throat scratchiness. Key raw materials in active calcium silicate market include limestone, hydrochloric acid, and sodium silicate. Limestone is used as chemical feedstock for lime, paints, and cement. Sodium silicate is used as feedstock for manufacturing zirconium, magnesium, and potassium silicates. These dynamics have significant impact on active calcium silicate market price trend. Active calcium silicate market size from fire protection applications should generate over USD 135 million in sales through to 2024. It is used in blast furnace, building walls, oil refinery, and electric arc furnace in blocks and boards forms. Growing high temperature insulation application scope in steel, glass and petrochemical industries should boost product demand. Crude oil is initially heated in a furnace during the extraction process to sustain high temperature generated during the process. Blast furnaces are used in steel industry for converting raw iron ore into steel by melting process and inner walls are composed of active calcium silicate bricks. Ceramic applications of active calcium silicate market may witness gains at over 3.5%, with tiles, false ceilings, plaster of paris, and roof manufacturing being key uses. Frequent and widespread use plaster of paris and false ceiling in construction projects will stimulate product penetration. Roofing for textile and automobile manufacturing plants also use this product in significant quantities. Strong regulatory compliances for infrastructure spending should drive ceramic tiles market growth demand. Ceramic tiles market size was valued at over USD 64 billion in 2015 and may generate over USD 150 billion in business by 2024, expects gains at 9%. They are used in construction industry for flooring due to high durability and thermal & shock resistance. In addition, high-performance ceramics have benefits in challenging and hostile environments with characteristics such as light weight, high hardness, corrosion resistance, and high melting point which should stimulate active calcium silicate market size. 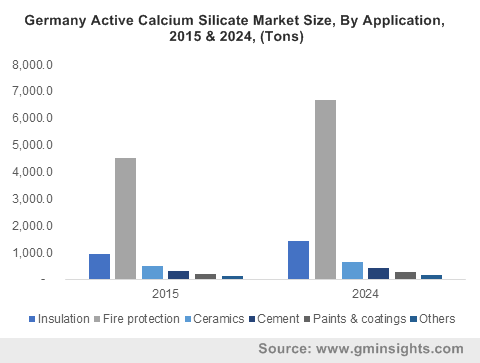 Within the Europe active calcium silicate market, Germany should surpass USD 17 million by 2024. Implementation of rules and regulations towards product standards and quality should drive regional growth. Increasing fireproofing cladding product demand for prevention against smoke, flames and fire spread should drive product demand. UK active calcium silicate market size may witness highest industry gains. Growth in paints & coatings applications to preserve or protect historical monuments should drive product demand. China active calcium silicate market consumption is forecast to be in excess of 15 kilo tons by 2024. Strong indicators for growth in infrastructure spending towards airports, highways, commercial complexes, and flyovers should drive regional industry. In addition, presence of large scale industries which include rubber, plastics, and paint & coatings should promote product demand for high temperature insulation applications. Brazil active calcium silicate market for ceramic tiles should witness consumption of over 90 tons by 2024. Rising consumer awareness to replace conventional floors & walls for aesthetic appearance should boost regional demand. Global active calcium silicate market is competitive; with American Elements, Promat International, Skamol, Ramco Industries, HIL Limited, and Johns Manville, Bee Chems, BIP Chemicals, Weifang Hong Yuan Chemical, Imerys Filtration Minerals, Anglitemp, 2K Technologies, and R.K. Oil Industries playing a key role. Companies operating in active calcium silicate market are focused on manufacturing and construction application space, with fire protection and insulation functions as key advantages which may create new growth avenues. Trade statistics show strong product exports to deficit regions such as South Africa, Saudi Arabia and UAE, which can offer strong regional presence. Active calcium silicate market products are available as boards, blocks, and powder form, but are majorly used in the former varieties. They have medium density in the range of 950 to 975 kg/cm3 and are used for technical applications such as sound absorbents and high temperature stability. Uses also include acoustic insulation, fire protection and portland cement to upscale material strength. In ceramics, it is used to reduce gas evolution and shrinkage during firing. In addition, it is used by tile factories, which incorporates ceramic to improve aesthetic appearance.